The gift has been given and the secret is out! 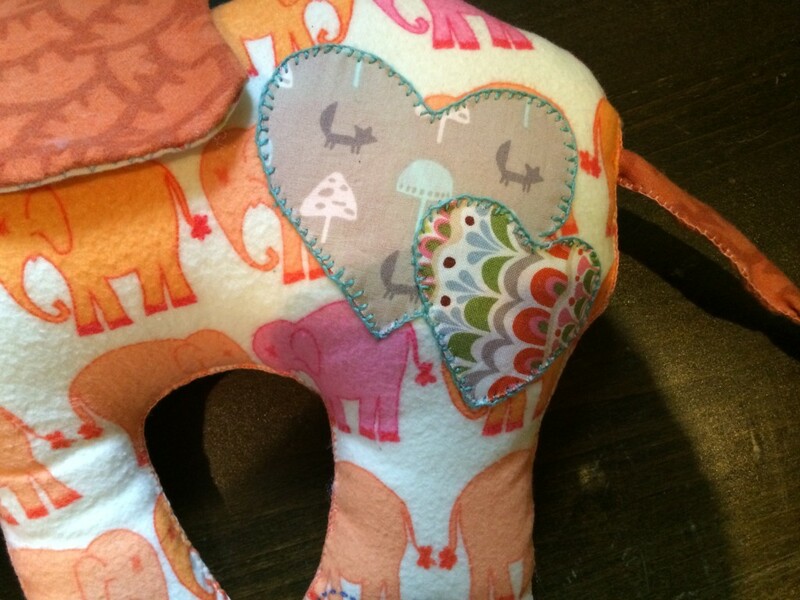 I made an elephant toy softie for a friend having a baby. Store bought gifts are important especially if there are specific gifts that are NEEDED. For the people you know the best sometimes a handmade gift feels much more personal (and can be added in with the stack of nice cloth diapers or changing table accessories etc…). Creating a gift is also an opportunity for you to play with your creative voice and give a gift from your heart. Giving a gift that is unique and is made in alignment with the values of the people the gift is for is also a great way to personalize your present on a deeper level. This particular family is very eco conscious, committed to reuse and sustainability. This is also something I care about too. So I wanted to make a gift that was sweet, special, cute and also made responsibly. To me making something responsibly means: purchase local and re-use the best I can. I knew I wanted to make a softie but I didn’t want to just go to a fabric store. So I went to my local thrift store (that supports the school district). Going to the thrift store always stokes my creative fire. One of the reasons I love this project so much is because it inspires and challenges creativity. You are going on a treasure hunt for an unknown object. 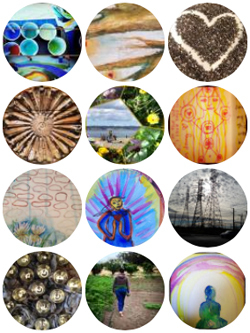 You are looking for something to call to you- to inspire your project. Once you find that fabric you will know. Listen to your intuition. Feel for that sparkle, wiggle maybe it’s even anxiety, fear or doubt that you notice. That is your creative voice and your artists fear. When I went to the thrift store I didn’t know I would be making an elephant. I expected to find a vintage printed tablecloth or cotton 70’s caftan. But instead I found a stash of amazing fabric and craft supplies. Amongst which I found this amazing and perfect soft flannel fabric. I had no idea what creature or thing I would be making. 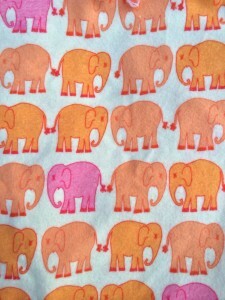 It was serendipity that I found the elephant fabric—especially for this particular friend who loves elephants. I couldn’t have planned this better. I found an unused bag of stuffing too! It was exhilarating to find what I needed to do this project, spending a fraction of the price of purchasing “new”, the ability to be creative and reuse and to support a local charity thrift store. Once you find the “thing” that speaks to you follow that. My next stop was the local quilt store to get accent fabric and a couple of embroidery threads. Get a couple other complementary fabric fat quarters or pieces (mine cost me only a few dollars each) and some embroidery thread that matches or clashes. I chose 2 complementary fabrics and one that coordinated with one of the other fabrics. I also chose embroidery thread that would stand out against the fabric and one that would blend in. I came home and washed and dried all my fabrics. It was dry outside so I put the stuffing out in the sun to sit for a day or so. If I had purchased the stuffing new I wouldn’t have done this. Let the details and creativity lead you. Look to others for inspiration. Once I had my fabric and knew what I wanted to make I searched and searched pintrest just gathering up ideas like twigs for kindling. This helped my get in the mindset for creating in this way and find what was possible. This was the most fun project I had done in a long time. I got so engrossed that I kept adding more and more details to it! 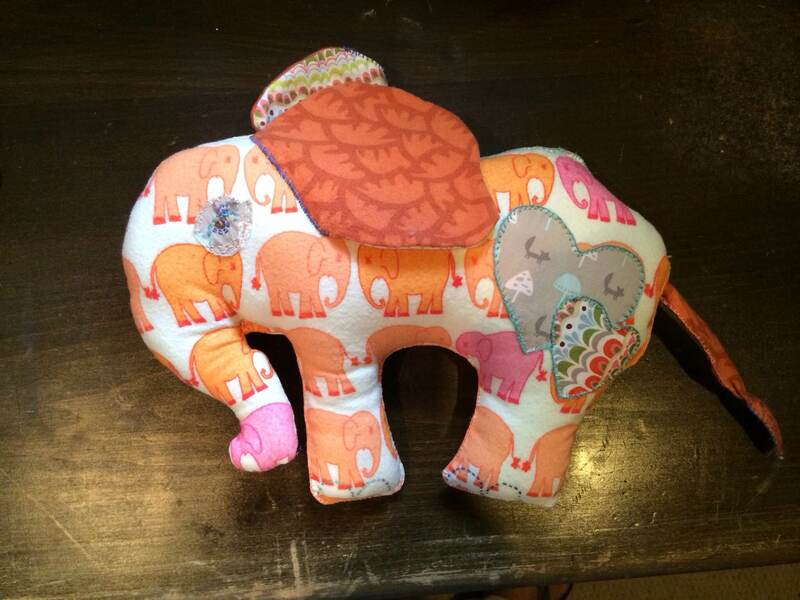 I didn’t want to stop working on this little elephant. But some good things must end and I was comforted by know there will be more babies on the way (and I can make softies whenever I want)! Would you trust yourself enough to embark on a project like this? The tutorial on how to make this? It’s up to you! I’d love to hear your thoughts. Write your thoughts and vote in the comments box! So sweet! I would not trust myself to make this – I have zero sewing skillz, but maybe it would be a good first project!! I’m so impressed that this was all hand-sewn! The lines are so perfect! I feel like if I’d tried to hand-sew this it would have been a mess. That’s a lucky baby getting that adorable elephant!